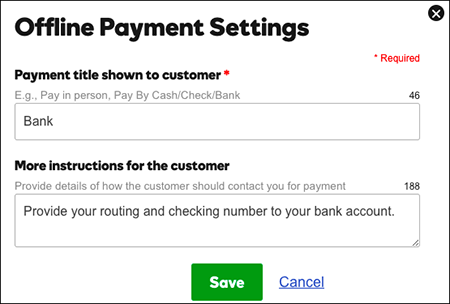 In addition to online payment options (Square, Stripe, and PayPal, you can create an offline payment method for your Online Store to accept cash, checks, or a bank transfer. 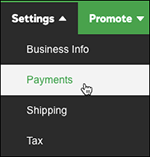 In the Payments window, scroll down to the Offline Payments section and click Enable. 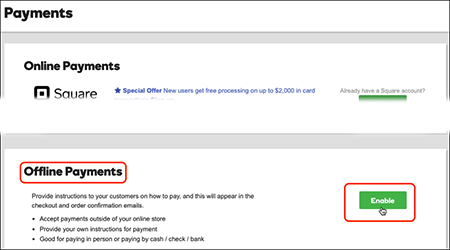 When you're done, click Save to activate the account's settings. Note: To change the settings, click Account Settings. Or click Turn Off to delete them entirely.